I am considering writing The Zippy Dictionary. Here are the entries so far. Personal transportation object. Must have interior covered in dog hair. It belongs to me, but a chauffeur is required to make it useful. Somewhat related to a similar transportation object, the “Good C-A-R,” but that object has never been accessible to me, so I cannot define it further. Generally fuzzy objects that make fascinating sounds for approximately 36 minutes, and then never again. The dog down the block. If sighted, much barking is required. Remembering reasons for proclaiming him Mortal Enemy is not required. Happy, happy day! We got to ride in the car and go all the way downtown. I like to go downtown. There are lots of people to meet and greet. Hi! Hi! Hi! Hi, hi, hi, hi, hi! Would you like an lick on the leg? A school bus toy! Cookies, cookies, cookies! 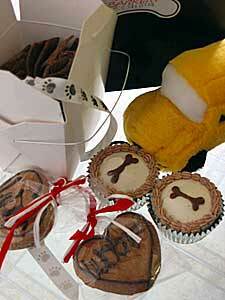 And those little pupcake things. I can hardly wait for those. We appreciate that the proprietor was very generous with the samples. We could put her out of business in a day and a half, if we were only allowed. Actually, my party is tomorrow, but that’s okay, it just makes the celebration last longer! Today, I got to share a doggy bag that my folks got at a restaurant I wish I could go to. Yummy pasta and cheese. Almost better than cake! So now I have to wait until tomorrow for cake. Do you know how long that is in dog years?